In my review last week of the very good Littlemill 22, 1989 from Archives, I said I’d have more older Littlemill next month. But here I am, a week early. And to think people say my reviews are untimely. This was distilled in 1992, a couple of years before the distillery closed. It was bottled in 2014 by Berry Bros. & Rudd. I believe this was a US release—I don’t think the cask number was specified. After my review of the old, unlamented official Littlemill 12, I’d lined up reviews of a number of more recently released older, indie Littlemills from the late 1980s and early 1990s. Somehow, I never got around to posting any of them. Here’s the first one. Here is another useless review. This Bladnoch was distilled in 1990 and bottled in 2013 by the Raymond Armstrong regime (they bottled it but it was distilled by the previous owners, United Distillers). The Raymond Armstrong era at Bladnoch, sadly, ended a couple of years ago and the new owners have gone the route of premiumization: the very opposite of Raymond’s approach. Well, this bottle is gone too. It was a single bourbon cask. I purchased it (and a few other Bladnochs) when the sale of the distillery was announced, and I opened it for one of my local group’s tastings last year. It did well enough there but I felt it improved as the bottle stayed open in the months following. These notes were taken towards the very end of the bottle when it had faded a bit again. I wish I’d thought of also recording my notes at the top and middle of the bottle. So it goes. I think I can say safely that this is the oldest Auchentoshan I’ve ever had. I’ve not had too many Auchentoshans of any age, actually—I’ve not been a big fan of most of what I’ve had and have therefore not sought out much more. On the one hand, the general profile seems to fall in an acidic bourbon cask spectrum made all over the Speyside; on the other, there’s been something a bit weird about most of the few I’ve had that I can’t quite describe (though I did like this 14 yo from Cadenhead’s). Anyway, I’ll be interested to see what longer aging has done to this cask, which was bottled jointly by Whisky Fässle and Whiskybase (for their Archives label). It seems to have divided opinion on Whiskybase quite widely—there are a lot of ratings for it and they go evenly from the high 70s to the low 90s. Consequently, perhaps, this is still available. Whisky geeks with good memories will remember David Driscoll of K&L making some impolitic remarks about Bladnoch a couple of years ago (first on his blog and then in an attempt to defend them on the WWW forum). Among his claims were that Bladnoch’s reputation was poor and that the Armstrongs’ “blending skills” for what they’d put out themselves had not been strong either. This was news to most of us as a) Bladnoch seemed to us like one of the most grounded and solid distilleries in Scotland: putting out quality malt at excellent prices with no marketing nonsense; and b) Bladnoch’s various “sheep” and “cow” label releases had been very well received in the main. I certainly hope that you don’t remember that a bit over a year ago I split a bunch of Scott’s Selection bottles on sale at a Minneapolis store with some friends and that Michael Kravitz (who was among that number) and I simul-reviewed some of them. This bottle was purchased from that very same store a year later and also split with friends; and while Michael K is again one of those who got part of this bottle we are not simul-reviewing it this year. This is because he now has a small child of his own which raises the number of distracted parties in the planning of any such possible undertaking from one to two. This is yet another of the Scott’s bottlings released in the mid-2000s that is still around in the US (stores from coast to coast have a number of these second and third-tier distillery bottles, often close to original prices). I’ve passed on it in the past because I never could find any information on it. Now I hope to be the source of such information for you if you too have occasionally paused in front of a bottle in a store, stared at if for a while and then moved on to a safer purchase. 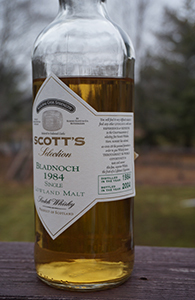 On a melancholy note: Scott’s Selection is now defunct and the fate of Bladnoch continues to be up in the air. I’ll drink to both tonight.